SAN CLEMENTE, CA--(Marketwired - Jan 21, 2014) - Once in a great while, an extraordinary opportunity presents itself. For Southern Californians who aspire to a spectacular Talega lifestyle and who want the pristine beauty of a brand new home, there will be Alora by William Lyon Homes, a limited edition coming soon to this coastal-close community. 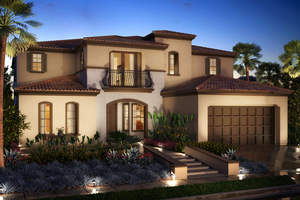 Alora at Talega in San Clemente will debut just 36 luxury single-family homes offering fresh innovative designs and features to impress the most discretionary buyer. Get on the inside track for this much-anticipated collection and express your interest by visiting www.LyonAlora.com to be among the first to learn about pricing, events and phase openings. "One of the most exciting aspects regarding Alora is that new home opportunities at Talega have been few and far between. This neighborhood will offer breathtaking new floorplans never seen before, designs that beautifully infuse indoor and outdoor living in a coveted Orange County environment," said Lesley Pennington, Vice President of Sales for William Lyon Homes. "To create this luxury collection, our team collaborated with notable architect Michael Woodley from Woodley Architectural Group to design richly detailed, expansive residences for those who aspire to the very best. Only a special few will be fortunate to make Alora their own and now is a particularly good time to visit www.LyonAlora.com to register one's interest and experience an online glimpse of the once-in-a-lifetime designs to be unveiled in the months ahead." Alora will present a limited edition of fresh new home designs that offer a prestigious lifestyle for the most discerning move-up buyer. Architecturally grand in scope and lavishly appointed with the finest amenities, this special enclave will feature two-story floorplans ranging from approximately 3,949 to 4,503 square feet, with 4 to 5 bedrooms, including first-level bedroom suites, 4.5 to 6.5 baths and unique 2-car garages + 1-car separate garage to 3-car tandem garages + 1-car separate garage. An unparalleled display of room options will provide the flexibility homebuyers demand to transform their living spaces as time and needs evolve. While they vary per residence, Alora's magnificent new home designs will feature optional wine storage, butler's a pantry, guest suite, study, expanded great room and balconies. Beautiful outdoor living spaces with optional kitchens will offer a year-round invitation to enjoy Talega's mild coastal climate and dine or entertain family and friends in an elegantly casual setting. Talega of San Clemente is conveniently located three miles from the Pacific Ocean. Residents enjoy a host of parks and recreational amenities, including 2,000 acres of open space and trails and the Talega Golf Club with its 18-hole, Fred Couples "Signature" championship golf course and Signature Grille. Among the privileges exclusive to Talega residents are the Talega Swim and Athletic Club, which has a clubhouse, multi-purpose sport court, sand volleyball courts, junior Olympic pool, resort pool and Splash and Play area. The community is within the Capistrano Unified School District that has two elementary schools and one middle school in Talega. Residents also have easy access to shopping and dining at the Talega Village Center. The Resmark Companies is William Lyon Homes' partner in developing Alora. Founded in 1995, Resmark is a leading national private equity firm focused on real estate and powered by core foundational discipline and focus. A fully integrated real estate investment group, The Resmark Companies' divisions -- Resmark Land and Housing, Resmark Apartment Living and Resmark Shopping Centers -- finance, acquire, develop and manage real estate in California and the Western United States and other select major metropolitan markets nationwide. William Lyon Homes introduces Alora, a limited edition of brand new homes coming to Talega in San Clemente. Register your interest today at www.LyonAlora.com.